Here at Moteefe, we're constantly trying to improve on pricing and our range of products. Now that summer's finally here, what better way to kick it off than a new incredible Moteefe promo to boost your sales this summer? 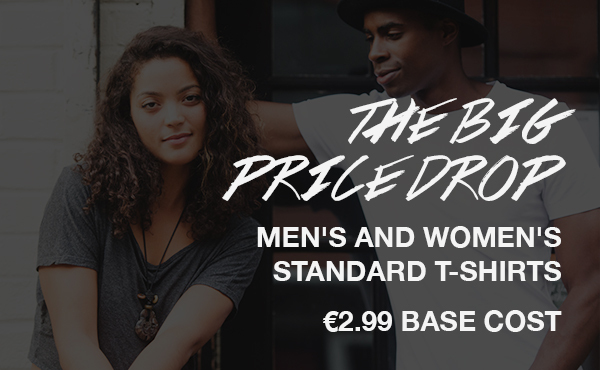 Starting on June 1st and until the end of the month, the base cost of our standard men’s and women's t-shirts will be a super-low price of only €2.99! We provide a total of 27 different colours in our standard t-shirt range, you’re guaranteed to make your designs stand out from the crowds with the wide variety of colours to work with. This is an incredible opportunity for all sellers like yourselves - both new and experienced - to launch campaigns and earn huge profits while maintaining the high quality standard of products we're commonly known for. It really is a win-win situation! With great quality products and a super-low base cost of €2.99, there's never been a better time to create campaigns on Moteefe!